The Vasomedical model Lumenair is the newest model EECP® device introduced by Vasomedical Inc. 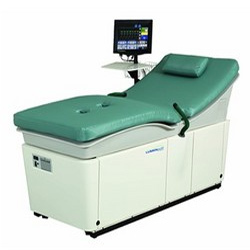 The Lumenair is revolutionary to Vasomedical EECP Therapy customers because of its unique smaller footprint. This unit is has condensed the traditional two-component system to one simple component reducing space considerably. Other improvements include the report, new inflation/deflation system (Trinity) and treatment platform (bed) fixed in an curved shape. We rate the Lumenair up high up on the footprint rating next to Cardiomedics. The Lumenair has mixed feedback in terms of patient comfort. The mattress is thin, harder in composition than previous models and lacks the ability for height adjustment. The user-interface has good reviews from users. Vasomedical claims to have a digital integration system but this capability is unknown. The rumor is that there is a separate apparatus that extracts information and plugged into another program. Vasomedical has been the innovator for ECP or as they trademarked EECP® therapy in many clincial aspects but slow to advance their technology . Although the treatment report is improved from previous models, the information reported remains very simple. The report from the Lumenair primarily the standard parameters of ECG, Inflation/Deflation timing, and arterial waveforms. The values are not recorded minute by minute therefore still behind report of its competitors. We are not aware of any cuff design enhancements but Vasomedical is always known for having comfortable, reliable cuffs that deliver a good squeeze. The Lumenair is second quietest machine in the industry next to the ACS NCP Plus. The Lumenair has lost some of the reliability credit of previous model devices. Continuous reports of ECG lead cable instability are the norm with this unit. The Lumenair has service available from the manufacturer Vasomedical but the cost of service is at a premium. The most expensive EECP device in the industry!! The see prices all over the board ranging from $55,000 – $75,000.